Scripture declares the importance of children’s involvement in the Kingdom of God. From silencing the enemies of God (Psalm 8:2) to signs and wonders (Isaiah 8:18, Joel 2:28) to leading in worship (II Chronicles 29:10-11) children have a place in the Body of Christ. Too many times they are relegated to back rooms and basements and if they have their own worship area, they end up segregated from the rest of the body 75% of time. It is important that children receive age-appropriate training, but the ultimate goal of that training is integration into the Body of Christ…not solely preparation for future service. The Same Holy Spirit resides in them.When children are filled with the Holy Spirit, they do not receive the Holy Spirit, Jr.The same Holy Spirit that fills adults, fills children. The problem is, too many times we base our understanding of spiritual growth dynamics on the physical world. In the case of children, their ability to mature spiritually is in a kind of hyper drive that we can’t comprehend when we are boxed in by our experiences in the physical world. Two and three year olds can hear the voice of God and obey; four year olds can intercede with understanding; elementary aged children can actually begin leading in worship and prayer. The “Body” needs their prayer power. Imagine the Kingdom of Light advancing with double strength overnight. If I could, I would flip a switch to activate all children currently receiving spiritual training to answer the call of the Spirit; our ranks would double or triple in a moment. Your local church needs their prayer power and expansive faith and so does the global Body of Christ. Think about it. What would happen if every kid in your church began to pray in earnest and in the Spirit? What would happen if suddenly their boundless faith was released to benefit the Kingdom? This generation demands to be included. According to studies and research, the Millennials generation is a generation that is demanding inclusion. “…born after 1982…as a group, Millennials are unlike any other youth generation in living memory. They are more numerous, more affluent, better educated, and more ethnically diverse. More important, they are beginning to manifest a wide array of positive social habits that older Americans no longer associate with youth, including a new focus on teamwork, achievement, modesty, and good conduct.” They are the ones who organized the neighborhood prayer vigils after 9/11; they are the ones who raised untold thousands in schools for tsunami victims in early 2005. Their actions put them in a position to be greatly used by society but most importantly, by God. Kids require training, not just teaching. Teaching is what we do for adults, training is what we need to be doing for children. When children come into this natural world, there are all sorts of training “modules” to help them navigate this existence. From potty training to making beds; from tying shoes to brushing teeth, training is required…and repeated over and over again. Now, contrast that with the kind of spiritual training kids are given. Who trains them in doing spiritual things? Sunday school teachers, parents, relatives, pastor? Consider the “dark side.” For this last section, ask yourself, “How old does a child have to be to handle spiritual weapons?” Next consider that there are over 200,000 child soldiers worldwide engaged in a conflict right now. Young children are being taught to use grenades, machine guns, rifles, vest-bombs, and more. Those working on the dark side know the value of children. Why is it teenagers can participate in suicide bombings? They are trained at a young age to handle explosives and are told what to expect in the next life if they become martyrs. Have you taught a Bible story lately that compares to that? Has anyone put a spiritual weapon in the hands of a child recently that has the power spiritually equivalent to a dirty bomb? If not, then don’t you think it’s time for a kids prayer ministry in your church? The kids are ready. God is ready. Are you? Prayer stations are small learning centers set up around a room or church that have a theme for prayer. They utilize objects related to the theme that help to instruct or stimulate the mind of the person praying with what to pray for. The objects may be things as simple as a picture or elaborate as a full-scale replica of a soldier with armor. The benefit of prayer stations is that they give kids a visual way to focus on praying for different things that they may not otherwise think of. The things they see will get them thinking and help them to focus. In addition, when they see related things in their everyday lives, it may cause them to remember that they prayed for a similar thing in kids prayer and remind them to pray again. Prayer stations can be set up in any room or even spread around the church building, such as on various hallway walls, the fellowship hall, prayer room, etc. Some kids prayer groups have dedicated rooms that they use each week where the stations may be assembled and left. Other groups have to share rooms and may have to put up and take down the stations each use. If you cannot leave a prayer station up, consider having a simpler station that won’t take a lot of effort to manage and store. There are many others but this gives you a starting point. You may also wish to create your theme based on some special focus that your church is promoting. This will help your children to feel like they are a part of the program and that they have something to contribute. When people (including children) feel ownership in something, they will tend to stick with it much longer. In addition, this will teach them to be supportive of the pastor and direction of the church leadership. The use of prayer station will vary based on the set schedule of your kids prayer meeting. 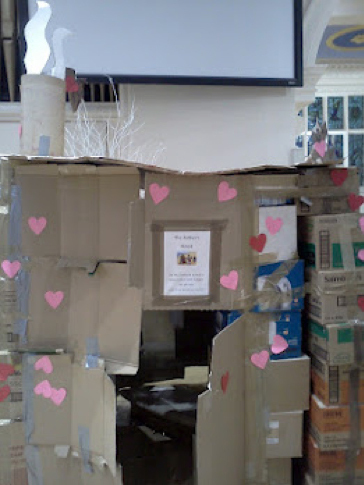 You can start with group worship and prayer and after everyone has their mind on the Lord you can allow the children to go the prayer station that they feel led to visit. You may also wish to try using prayer stations first, as a way to get children praying before your regular lesson or group prayer time. You will need to stress to the group the importance of being serious and actually praying – not just playing with the items. When you first get started you may need to have an adult helper at each station to help train the child what to and how to act. 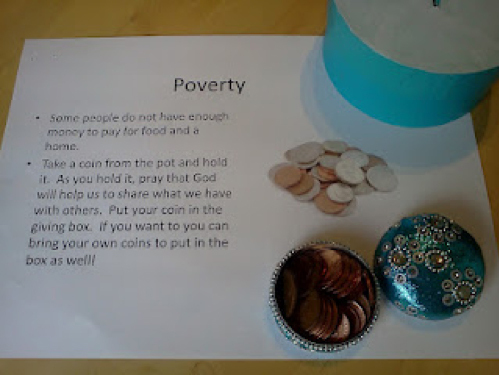 When the child gets to the prayer station, they will use the items you’ve placed at the station as reminders and ideas of what to pray for. The child can hold photos, flags, lists, clothing, and other items at the station as they pray. 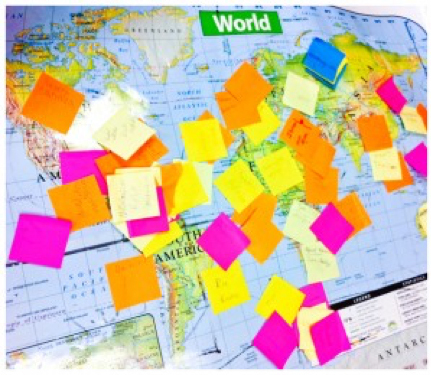 If you use maps to pray for areas of the world they can place their hand on specific areas while praying. You may wish to play soft worship music in the background while the prayer stations are in use. 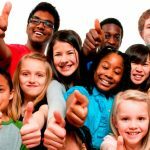 Bring the kids back together and have time worshipping and thanking to God for hearing you and for all He’s done during your prayer time. After prayer, have a time where you ask the children if God shared anything with them while they were praying. This is a vital step as it gets the children in the practice of listening for God speaking to them. Write down whatever they share (even if it doesn’t always make sense) and always encourage them that they did a great job listening for God’s voice and sharing what they felt. Although their answers may not always make immediate sense to you, or them, oftentimes you will see similar theme or word from God during follow-on church services, prayer times or things that happen. God does speak to children. They say it takes 10,000 hours to perfect a skill. The average prayer time a child spends in prayer on a non-church day is two minutes. At 10,000 hours (600,000 min), that would take 300,000 days, or 42857+ weeks, or 824 years. We need a prayer life, not prayer moments. Our kids need prayer modeled at home, and training in their everyday life. 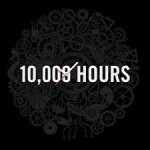 10,000 hours is simply impossible with only two minutes a day. The following prayer resources were developed for Ladies of Prayer International to equip mothers, grandmothers, and teachers in training children to pray. They are available for you to use in your own home or church. 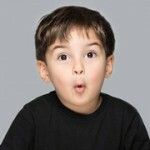 Young kids are generally ego-centric by nature. When you ask them what they need, they may come up with answers such as toys, new shoes, a new dress, a puppy, and so on. Though these things are not bad, they do not need to be the only thing we have our children pray for. 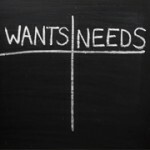 Children need to understand the difference between what truly is a need, and what is simply a desire. God has promised us to give us our needs; everything else is just added blessings. During my Kids Prayer class, I occasionally bring in some random photos of objects. These are things that could be classified as either a “want”, a “need”, or both. As we go through the images, I ask them whether that object is something they absolutely need, or is it just something a child may want. For example, if I show a picture of water, I ask them if water is a want or need. They answer with what they think. We then talk about that object, and what the correct answer is. I also talk about how that object affects other people. 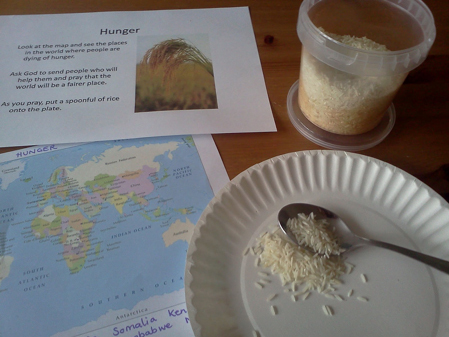 For example, we know that water is a definitely a need and yet many areas of the world do not have clean water to drink. This starts training them to have a worldview so they can learn to pray for others and not just themselves. Since children are visual, use photos or bring in objects that they can see and/or feel. Give thanks for the needs God has provided, and extra thanks for all the extra things. If we were to choose to between someone saying the first phrases about us over the latter, I assume most of us would choose the latter. Wide eyes and exclamation points of excitement should make any of us smile while the disappointed sighs of drudgery can deflate the largest of our egos. We enjoy when others enjoy us, and even more, when they like us. We were made in the image of God, and He’s no different. He enjoys it when we enjoy Him. Perhaps you can recall a Christmas when you sacrificed to give your child that one gift you just knew they’d love. Some of you may smile as you remember the wide eyes, the jumping up and down, and the squeals of glee that pierced your ears. Others of you may recall the pouty lips, shower of tears, and perhaps even a temper tantrum that sent the gift flying across the floor while you were told you were the worst parent in the world. It’s funny how one reaction can make you want to give more or vow to give gift socks and underwear for the rest of their spoiled, little life. The primary reason for our existence is to worship and have a relationship with God; all else is secondary. A happy life is secondary. A faith-filled family is secondary. Answers to our prayers are secondary. Good health is secondary. A powerful ministry, or a big church is secondary. A life without troubles is not even secondary – it’s impossible. Yet these often become our primary occupation and when that happens, we find ourselves looking at God through the eyes of humanity instead of the magnifying glass of deity. How is it that our main occupation for existence can become something routine and artificial toward the One who created the worlds with mere words – the same One who longs deeply just to be with us? When did the wide eyes and exclamation points of worship and prayer start getting traded in for the groans and sighs? Most of us know that we need to pray. There are souls that need saved. There are people who need delivered. There is sickness that needs healed. But we can find ourselves replacing these secondary things for the primary, and in the process, replace relationship with religion. God didn’t create us for religion; He created us for Him. In the year 2015, the Lord gave me a theme for the year that I taught in most places I went to teach on Kids Prayer – if you want kids and young people to pray, then show them a God that they would enjoy praying to. Looking back over my earlier life I found myself recalling how prayer was often not that enjoyable. It was full of church prayer meetings, altar calls, and prayers for others, but something always seemed missing. I prayed out of duty, when all the while I wanted to pray out of desire. I wanted to enjoy what I was doing. Psalm 100 talks about our worship and relationship being filled with joy, songs, and gladness. Sometimes we relate these scriptures to our outward expressions of praise, but these are attitudes of the heart; they can’t be artificial or rehearsed words and be true. Joy comes from the inside. If we want kids to pray then they need to see us enjoying our time with God. They need to see us amazed by the simplest things about God – not just what He does, but who He is. They need to see us wide-eyed at some new thing He reveals to us. They need to hear us be speechless at His love that’s shown in those around us. They need to see us smile when we pray. I know that prayer is hard at times, but if that’s all they see they will not be drawn to relationship. Rather, they will learn religion, routine, and eventually, probably leave it altogether. They need to know that being a prayer warrior is secondary, and being a pray-ER is primary. True relationship is give and take. When we fulfill our primary purpose, we automatically become fulfilled ourselves. When we are full, we are content, we are at peace, and we want that experience to happen again and again. Prayer is not all about asking God for things. In our training sessions with kids we often make them wait to pray for needs until after we’ve spent time just talking to God about random things, and telling Him about our day. We talk about the little things that make God big. We bring the wonder and amazement of God back to them, where they sit wide-eyed and they utter those phrases and exclamation points under their breath, and then aloud in worship. Needs are always secondary. It’s no wonder that God directed the Church of Ephesus in Revelation 2 to return to their first love. They had all the duty and disciplines, but they lost their desire. In the Old Testament the nation of Israel consistently traded relationship for religion. The New Testament notes time and again how the scribes and Pharisees focused more about their duties then they did about God or others. As parents, if our children prophesied, cast out devils, and did many wonderful works, we’d probably feel successful in our parenting and training. But Matthew 7:22-23 says, “Many will say to me in that day, Lord, Lord, have we not prophesied in thy name? and in thy name have cast out devils? and in thy name done many wonderful works? And then will I profess unto them, I never knew you: depart from me, ye that work iniquity.” God’s first desire is to know us, and that only comes through consistent prayer and relationship. People continue doing what they enjoy. Prayer can be a joy. Prayer disciplines are vital to keep us balanced. Methods, steps, and keys to a successful prayer life for you and your kids are all beneficial, but the true method, the first step, and the ultimate key, is simply to like the One you are praying to – to enjoy Him. So make God big to them. Show them a God that amazes them with who He is and what He’s created. Show them a God who exists in the painful experiences of life. Show them a God that is good, despite how many answers to prayer there have been. Talk about Him before asking what you want Him to do. Lead them to fall in love with Him, and you will start to hear the sighs and groans replaced with the exclamation points that will last all through their lives and into the lives of their next generation. Let’s face it… humans are emotional creatures! In the course of one day we can experience a mirade of emotions, from one end of the spectrum to the other. One minute we can be happy and the next sad. Some of us experience more emotions than others, but regardless of how much we show emotion, we all have emotion. God created us in His image; He is an emotional God. Often our prayer time is full of intercession, requests, and words of worship, as is fitting. But how often do we share the emotional side of our humanity? Scripture teaches us that God wants us all of us, not just a part. This means that He also wants us to share our ideas, our feelings, our interests, and even our emotions. Emotions are a natural part of our relationships with others, and should also be a natural part of our relationship with God. Rather than hide our emotions, or withhold them as if God is not interested, we can share what we feel, when we feel it, and even how we feel it, as long as it’s done with respect. Strong feelings that are surpressed will eventually find a way to be expressed, but sometimes to a fault. When emotions (that negatively affect us) are bottled up for long periods of time and then finally realeased, it can cause loss of control and have damaging effects. Instead, if we get into the habit of being open with God about our feelings as we go through life, the more He can help us, and the more of a relationship with Him we will build. 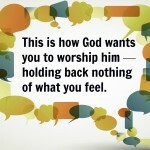 Negative emotions are not the only type we should share with God. As we encounter our happy moments, excitement, wonder, confusion, peace, and more, we can share these with Him and how they affect our life. God is intereseted in our life, not just our requests. Children abound with emotion. In training them to pray they need to know that they can share their feelings (good and bad) with God and He will listen and care. The more of a “safe” environment we help them find in their prayer time with God, the more they will feel comfortable returning to it. During a recent Kids Prayer training night, I brought in a paper that showed different facial expressions. The kids enjoyed mimicking the faces and sharing their stories of when they felt a particular emotion we were discussing. With each one, we discussed how they could take the situation that they shared and turn it into a conversation with God. They were able to express their giggles with God, their smiles, tears, fears, worry, guilt, embarrassment and more. Suddenly, it was as if a whole new part of God opened up to them – a God who cared about who they were. They found a “new” friend. It’s great to understand that we can be absolutely honest, and open with God at all times. I’m so thankful for the safety we have, and that kids have, in our relationship with Him. I don’t always get prayer right. Much of what I originally learned about prayer was done through watching others – people who made mistakes as well. That’s not to say that each of these people I emulated was wrong because many of them had great prayer disciplines and consistency that are vital. However, sometimes prayers were emotionally driven rather than scripturally based. Sometimes prayers were limited to timeframes, rules, methods, and lists where it was ONLY a discipline and not a desire. Sometimes prayers were measured by eloquent words or the loud and dramatic way it was presented. It’s true that “Prayer is Powerful” but only because of God is the source, not us. I don’t know anyone who gets prayer right all the time. Our human mind cannot always discern the mind of God – His ways are higher than our ways, and His thoughts above ours. Our emotions and human will gets in the way sometimes and directs our speech and desires in prayer. Because children watch us and learn, they too will pray incorrectly at times. Their adolescent minds will not be able to always understand right from wrong and if they are not studying or being taught the Word of God, they will struggle with knowing the will of God. All of this becomes reflected in their prayers. Don’t reprimand them for what they pray. There will be times that young people pray something that is not proper or in the will of God. They may pray for a million dollars to buy new toys, or pray that a bully at God would get sick and die. This is an emotion-based, egocentric approach that is normal for their age. They may pray for God to help them pass a test that they did not study for, or to not let their parents find out that they did a certain action. These are prayers prayed out of desperation and a desire to not be accountable for their actions. God will not answer prayers that go against His will or His Word. If we reprimand them, they may feel afraid to pray again. Rather than reprimanding them, tell them they did a great job trying and give them some ideas of how to pray a better prayer next time. Talk about the issue. Help them have better understanding. If possible, pray again right then so they immediately practice what you are directing them to do. In addition, I believe that prayer should never be used as a punishment. Children will do things wrong. As parents and adults we know that God can help us change our actions. Sometimes in our desperation and zeal to force change we may tell a child to go pray about what they just did. When that happens, prayer can become a punishment to them rather than something they desire to do. They may end up seeing God as a big bully who is upset with them rather than being a loving God that they can turn to. Rather than force children to pray out of reactionary responses to anger, take them by the hand and go to God together and ask Him for His help as both a parent and a child. Pray for patience, peace, and help in the situation. Thank God (in front of the child) for the times that He has helped you to change things that you did wrong. Affirm the child before God. Regardless of what that child did wrong, they matter to God and they are important. God hates sin, but He loves the sinner and we must emulate that as well. As we recently learned, prayer can be simple. There is no special formula or method. There are no tried and true 12-step programs; there is simply, prayer. The more we realize how simple it is, the more freedom we will have it exploring it, and thereby, exploring God. God is our friend. God knows us. God knows our life. When we talk with our best friend about our life, we share everything. We talk about the good times, and the bad. We express our emotions, our thoughts, our anger, and all the other host of emotions, responses, and questions that come along with it. We talk about our disappointments as well as our successes. We are real. Rarely are people best friends with someone who they have to pretend around. God is absolute Truth; He will not pretend. He will not lie. He will not expect us to either. If God is our friend then honesty is critical in our relationship with Him. We must not give Him a facade of a person or a life in efforts to look, or be, anything but what we truly are. God wants US, not a false image of US. In addition, we can trust God with our “realness” as long as we do so with respect. We can share our innermost thoughts without fear. We can talk to Him about desires that no one else may understand. We can be real and not worry that we will be rejected. And we can always go to Him, even when there is no one else to go to. This aspect of honesty is absolutely critical in our own prayers, and in training kids to pray. Honesty brings light and revelation to our life, and removes darkness that satanic forces work in. When we hide things we are giving Satan a stronghold in our life. When we become open, we reveal everything, thereby taking away any power he can try to hold in our life in that situation. Allow young people to say what’s on their heart about something. The more that they feel safe to share their feelings or thoughts, the more apt they will be to do it. Safety brings honesty, openness, and removes fear. As long as we are respectful we (and our kids) can share anything with God. Expressions of anger, bitterness, or unforgiveness cannot be healed or resolved unless we cause them to be revealed to the One who can heal us. Sometimes the simple act of being able to speak openly what we feel can heal us, even if the situation never changes. When you pray in front of them, be real with your prayer as well. Talk with God openly about your stressful day, your happy times, and your concerns. The more open you are with God, the more open they will learn to become with Him as well. In our last lesson in this series we covered the method of “Modeling Prayer” as an adult, parent, or trainer. Modeling prayer is vital in the learning process of children, but it goes beyond that. Although we must show by example a prayerful life, we also have to show it in a way that can be replicated. If I took a grade school child and set them all day under a college professor to learn, most people would think I was crazy. Long auditory lectures often bore some of the most intellectual adult minds I know, much less a young child. A child’s brain is not developed enough to be able to understand big words, complex phrases, or abstract concepts. They take words literally. If I talk about the “God’s blood covering me” a very child may become scared or grossed out because they think in literal terms. If I talk or pray about the “anointing of God’ on someone’s life, they may not understand what that words means. If I pray long or complex sentences, they may feel like they could never pray like that, and give up trying. As we train kids to pray, we need to think like a kid and adjust our methods so they will feel like prayer is something they can do, rather than feel like they have to wait until they are an adult. We should not assume that adult prayer is the only type of prayer. Use simple words that kids can understand when you pray and when you train them. Before you pray, tell the kids what you are praying about, and what you are praying for. Ask them if they understand words that you may pray or the topics being covered. People can’t have faith to pray for something that they don’t understand. When using scriptures in your prayer time, you may wish to use a different translation of the verse that they can understand better. Kids do not understand King James terminology very well. If you are going to pray using scripture, be sure they understand that scripture first. Use acronyms to teach prayer topics or concepts such as A.C.T.S. (Adoration, Confession, Thanksgiving, Supplication). Use the Hands-On post cards to train them how to lay hands on others as they pray for Healing, Anointing, Needs, Deliverance, and Salvation. Use this five finger poster as another prayer guide or teach them to pray for their world using simple things like candy. The more simple you make it, the more they will feel like they can do it. Here is a good exercise for you as a parent or trainer: The next time you are at a prayer service, purposefully listen to the prayers of those around you. Listen as a child. Ascertain whether the words being spoken by those praying would be understandable to a young kid. Determine whether a child could easily understand the words and be able to replicate them in prayer with their faith and words. In order to become a trainer of prayer, we must also learn to be a student of prayer. The more we learn, the better we can train. Check back soon with us on our next topic in this series: Be Real.